Do You Need Emergency Dentistry Services? It is possible to prevent dental accidents, but when you are prepared to take control if one does occur can mean the difference between saving and losing a tooth. If a dental injury does occur to your teeth or oral tissues, call your emergency dentist immediately. Many dentists allot time in their daily schedules for emergencies and are qualified to treat an array of dental injuries. Falling down or suffering a hard hit to the face while participating in a sport or other recreational activity can result in the loss of one or multiple teeth. If a tooth is knocked out it is important to first retrieve the dislodged tooth and gently rinse it in water. When you rinse your tooth, be very careful not to remove any attached tissue. Gently attempt to place the tooth back into its socket. If that doesn’t work, place the tooth in a small cup of milk or salt water solution and get to your dentist as soon as you can. The faster you get to your emergency dentist, the better chance you will have of saving your tooth. 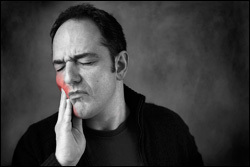 Injuries to the tongue, lips, gums and cheeks can cause pain, swelling and bleeding. Rinse your mouth with warm water and apply direct pressure to the affected area with moistened gauze or a tea bag. You can also reduce swelling and slow the bleeding by applying a cold compress to the outside of your cheek or mouth. If the bleeding doesn’t stop after 20-30 minutes of ice and pressure, the injury may require professional medical attention and you’ll need to get to your dentist or emergency room right away. As a general rule, if it hurts, it’s a dental emergency. Don’t delay. Visit your emergency dentist immediately if you are experiencing pain caused by an injury to your mouth or teeth. A speedy treatment significantly improves your odds of saving a damaged or injured tooth.